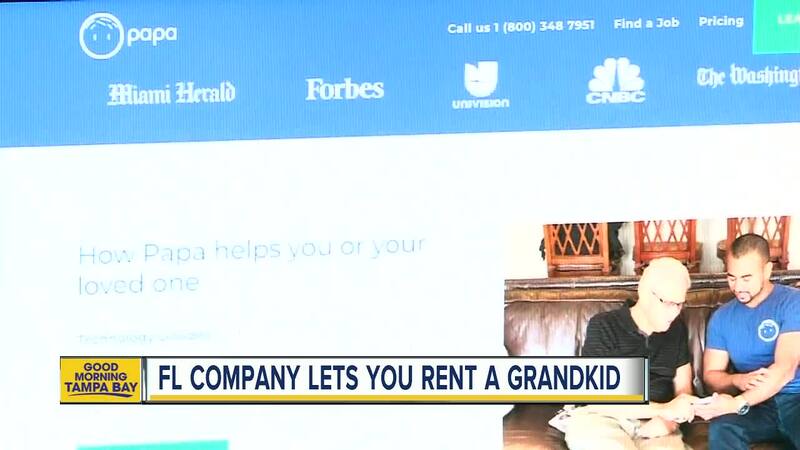 Grandparents can now rent a grandkid to help with daily tasks or for companionship. “I’m just safer, you know,” Carroll-Marks said. “There’s less chance of her falling or not seeing something on the ground,” Shannon said. Carroll-Marks is 66, a retired computer programmer. Shannon is 35, and taking health management classes at Palm Beach State. Carroll-Marks doesn’t have a nurse to take care of her daily anymore. Papa is an eight-person, Miami-based service, available throughout South Florida, Ft. Myers and Tampa. The company has about 250 active seniors and 300 pals. Pals are always vetted students who usually study medicine, nursing or hospitality. The pal is paid hourly, but it’s hard work. “A woman needed to go to a wedding, so a pal was essentially their date for the wedding. Took her, picked her up, took her to the wedding. They were together for like 10 hours,” Burch said. Carroll-Marks is a premium member. $30 a month plus $15 an hour provides her a pal seven days a week. Three of them are with Shannon. There are two other less expensive plan options. One of Carroll-Marks's adult children lives about 90 minutes away. The other lives in New York. “We’re hoping to take a trip to visit him up there,” Shannon said. “The most important thing is I feel comfortable and I feel taken care of and we can talk and be friends,” Carroll-Marks said. You can visit them online at www.joinpapa.com or call 1-800-348-7951.